From BioWorld. 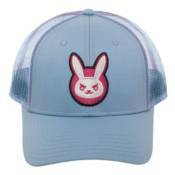 Separate yourself from the casuals with this Overwatch Snapback Cap! Featuring an embroidered design, this high quality hat fearures an adjustable back for flexible sizing.